The Chechen–Russian conflict (Russian: Чеченский конфликт, Chechenskiy konflikt) is the centuries-long conflict, often armed, between the Russian (formerly Soviet) government and various Chechen forces. Formal hostilities date back to 1785, though elements of the conflict can be traced back considerably further. The Russian Empire initially had little interest in the North Caucasus itself other than as a communication route to its ally Georgia and its enemies, the Persian and Ottoman Empires, but growing tensions triggered by Russian activities in the region resulted in an uprising of Chechens against the Russian presence in 1785, followed by further clashes and the outbreak of the Caucasian War in 1817. Russia only succeeded in suppressing the Chechen rebels in 1864. During the Russian Civil War, Chechens and other Caucasian nations lived in independence for a few years before being Sovietized in 1921. During World War II, the Chechens saw the German invasion as an opportunity to revolt against the Soviet regime. In response, they were deported en masse to Central Asia where they were forced to stay until 1957. The most recent conflict between Chechen and the Russian government took place in the 1990s. As the Soviet Union disintegrated, the Chechen separatists declared independence in 1991. By late 1994 the First Chechen War broke out and after two years of fighting the Russian forces withdrew from the region. In 1999, the fighting restarted and concluded the next year with the Russian security forces establishing control over Chechnya. The North Caucasus, a mountainous region that includes Chechnya, spans or lies close to important trade and communication routes between Russia and the Middle East, control of which have been fought over by various powers for millennia. Russia's entry into the region followed Tsar Ivan the Terrible's conquest of the Golden Horde's Khanates of Kazan and Astrakhan in 1556, initiating a long struggle for control of the North Caucasus routes with other contemporary powers including Persia, the Ottoman Empire and the Crimean Khanate. Internal divisions prevented Russia from effectively projecting its power into the region until the 18th century; however, Russian-allied Cossacks began settling the North Caucasus lowlands following Ivan's conquests, sparking tensions and occasional clashes with Chechens, who at this time were themselves increasingly settling the lowlands due to adverse climatic changes[a] in their traditional mountain strongholds. In 1774, Russia gained control of Ossetia, and with it the strategically important Darial Pass, from the Ottomans. A few years later, in 1783, Russia signed the Treaty of Georgievsk with Georgia, making Georgia—a Christian enclave surrounded by hostile Muslim states—a Russian protectorate. To fulfill her obligations under the treaty, Catherine the Great, Empress of Russia, began construction of the Georgian Military Road through the Darial Pass, along with a series of military forts to protect the route. These activities, however, antagonized the Chechens, who saw the forts both as an encroachment on the traditional territories of the mountaineers and as a potential threat. Around this time, Sheikh Mansur, a Chechen imam, began preaching a purified version of Islam and encouraging the various mountain peoples of the North Caucasus to unite under the banner of Islam in order to protect themselves from further foreign encroachments. His activities were seen by the Russians as a threat to their own interests in the region, and in 1785, a force was sent to capture him. Failing to do so, it burned his unoccupied home village instead, but the force was ambushed by Mansur's followers on its return journey and annihilated, beginning the first Chechen–Russian war. The war lasted several years, with Mansur employing mostly guerilla tactics and the Russians conducting further punitive raids on Chechen villages, until Mansur's capture in 1791. Mansur died in captivity in 1794. In 1801, Russia formally annexed Georgia, deepening Russia's commitment to the region. [verification needed] In subsequent years, a growing number of small-scale raids and ambushes by Chechen fighters on Russian forces moving through the Caucasus prompted the Russians to mount two substantial military expeditions into Chechen territory, both of which were defeated, and Russian leaders began considering more drastic measures. These were postponed however by Napoleon's 1812 invasion of Russia. After Russia's defeat of French Napoleonic forces in the 1812 war, Tsar Alexander I turned his attentions once more to the North Caucasus, assigning one of his most celebrated generals, Aleksey Petrovich Yermolov, to the pacification of the region. In 1817, Russian forces under Yermolov's command embarked upon the conquest of the Caucasus. Yermolov's brutal tactics, which included economic warfare, collective punishment and forcible deportations, were initially successful, but have been described as counterproductive since they effectively ended Russian influence on Chechen society and culture and ensured the Chechens' enduring enmity. Yermolov was not relieved of command until 1827. A turning point in the conflict was marked in 1828 when the Muridism movement emerged. It was led by Imam Shamil. In 1834 he united the North Caucasus nations under Islam and declared "holy war" on Russia. In 1845 Shamil's forces surrounded and killed thousands of Russian soldiers and several generals in Dargo, forcing them to retreat. During the Crimean War of 1853–6, the Chechens supported the Ottoman Empire against Russia. However, internal tribal conflicts weakened Shamil and he was captured in 1859. The war formally ended in 1862 when Russia promised autonomy for Chechnya and other Caucasian ethnic groups. However, Chechnya and the surrounding region, including northern Dagestan, were incorporated into Russia as the Terek Oblast. After the Russian Revolution, the mountain people of the North Caucasus came to establish the Mountainous Republic of the Northern Caucasus. It existed until 1921, when they were forced to accept Soviet rule. Joseph Stalin personally held negotiations with the Caucasian leaders in 1921 and promised a wide autonomy inside the Soviet state. The Mountain Autonomous Soviet Socialist Republic was created that year, but only lasted until 1924 when it was abolished and six republics were created. 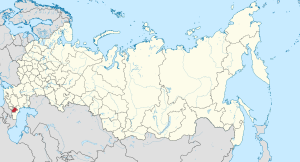 The Chechen–Ingush Autonomous Soviet Socialist Republic was established in 1934. Confrontations between the Chechens and the Soviet government arose in the late 1920s during collectivization. It declined by the mid-1930s after local leaders were arrested or killed. Nazi Germany invaded the Soviet Union in June 1941. According to Soviet sources, Chechens joined the Wehrmacht, although this claim is disputed as little evidence exists. By January 1943, the German retreat started, while the Soviet government began discussing the deportation of Chechen and Ingush people far from the North Caucasus. In February 1944, under the direct command of Lavrentiy Beria, almost half million Chechens and Ingush were removed from their homes and forcibly settled in Central Asia. They were put in forced labor camps in Kazakhstan and Kirgiziya. After Stalin's death in 1953, Nikita Khrushchev came to power and soon denounced his predecessor. In 1957, Chechens were allowed to return to their homes. The Chechen–Ingush Autonomous Soviet Socialist Republic was reestablished. The violence began in 1958, upon a conflict between a Russian sailor and an Ingush youngster over a girl, in which the Russian was fatally injured. The incident quickly deteriorated into mass ethnic riots, as Slavic mobs attacked Chechens and Ingushes and looted property throughout the region for 4 days. Ethnic clashes continued through 1960s, and in 1965 some 16 clashes were reported, taking tall of 185 severe injuries, 19 of them fatal. By late 1960, the region calmed down and the Chechen–Russian conflict came to its lowest point until the dissolution of the Soviet Union and the eruption of Chechen Wars in 1990. In 1991, Chechnya declared independence and was named the Chechen Republic of Ichkeria. According to some sources, from 1991 to 1994, tens of thousands of people of non-Chechen ethnicity (mostly Russians, Ukrainians and Armenians) left the republic amidst reports of violence and discrimination against the non-Chechen population. Other sources do not identify displacement as a significant factor in the events of the period, instead focussing on the deteriorating domestic situation within Chechnya, the aggressive politics of the Chechyen President, Dzhokhar Dudayev, and the domestic political ambitions of Russian President Boris Yeltsin. Russian Army forces were commanded into Grozny in 1994 but, after two years of intense fighting, the Russian troops eventually withdrew from Chechnya under the Khasavyurt Accord. Chechnya preserved its de facto independence until the second war broke out in 1999. In 1999, the Russian government forces started an anti-terrorist campaign in Chechnya, in response to the invasion of Dagestan by Chechen-based Islamic forces. By early 2000 Russia almost completely destroyed the city of Grozny and succeeded in putting Chechnya under direct control of Moscow. According to Norman Naimark, "serious evidence indicates that Russian government developed plans to deport the Chechens once again in the mid-1990s if they had lost the war." Since the end of the Second Chechen War in May 2000, low-level insurgency has continued, particularly in Chechnya, Ingushetia and Dagestan. Russian security forces have succeeded in eliminating some of their leaders, such as Shamil Basayev, who was killed on July 10, 2006. After Basayev's death, Dokka Umarov took the leadership of the rebel forces in North Caucasus until his death owing to poisoning in 2013. Radical Islamists from Chechnya and other North Caucasian republics have been held responsible for a number of terrorist attacks throughout Russia, most notably the Russian apartment bombings in 1999, the Moscow theater hostage crisis in 2002, the Beslan school hostage crisis in 2004, the 2010 Moscow Metro bombings and the Domodedovo International Airport bombing in 2011. Currently, Chechnya is now under the rule of its Russian-appointed leader: Ramzan Kadyrov. Though the oil-rich region has maintained relative stability under Mr. Kadyrov, he has been accused by critics and citizens of suppressing freedom of the press and violating other political and human rights. Because of this continued Russian rule, there have been minor guerilla attacks by separatist groups in the area. Further adding to the tension, jihadist groups aligned with the Islamic State exist in the region. The exact casualties of this conflict are difficult to ascertain due to lack of records and the long time period of the clashes. One source indicates that at least 60,000 Chechens were killed in the First and Second Chechen War in the 1990s and 2000s alone. High estimates of these two wars range of up to 150,000 or 160,000 killed, as put by Taus Djabrailov, the head of Chechnya's interim parliament. ^ Namely, the Little Ice Age. ^ "Chronology for Chechens in Russia". University of Maryland. Archived from the original on 2013-12-20. Retrieved 12 July 2013. ^ "Chechnya – Narrative" (PDF). University of Southern California. Archived from the original (PDF) on 2016-09-02. Retrieved 12 July 2013. Russian military involvement into the Caucasus started early in the 18th century and in 1785–1791 the first major rebellion in Chechnya against the imperial rule took place. ^ Schaefer 2010, pp. 49–50. ^ Schaefer 2010, pp. 51–54. ^ a b Schaefer 2010, pp. 52–53. ^ Dunlop 1998, pp. 4–6. ^ Schaefer 2010, pp. 54–55. ^ Schaefer 2010, pp. 55–57. ^ Schaefer 2010, pp. 55–58. ^ Dunlop 1998, pp. 10–13. ^ Dunlop 1998, p. 13. ^ Schaefer 2010, p. 58. ^ Shultz 2006, p. 115. ^ Schaefer 2010, pp. 58–61. ^ a b c Shultz 2006, p. 116. ^ a b Shultz 2006, p. 117. ^ Shultz 2006, p. 118. ^ a b Shultz 2006, p. 119. ^ Shultz 2006, pp. 120–121. ^ Shultz 2006, p. 121. ^ a b Seely, R. Russo-Chechen conflict, 1800–2000: A Deadly Embrace. Frank Cass Publishers. 2001. ^ O.P. Orlov; V.P. Cherkassov. Россия — Чечня: Цепь ошибок и преступлений (in Russian). Memorial. ^ Kempton 2001, p. 122. ^ Smith 2005, p. 134. ^ King 2008, pp. 234–237. ^ Ware 2005, pp. 79–87. ^ Kumar 2006, p. 61. ^ Kumar 2006, p. 65. ^ a b c James 2001, p. 169. ^ Naimark, Norman M. (2002). Fires of Hatred: Ethnic Cleansing in Twentieth-century Europe. Cambridge, Mass: Harvard Univ. Press. p. 106. ISBN 9780674009943. ^ Parsons, Robert (8 July 2006). "Basayev's Death Confirmed". Radio Free Europe/Radio Liberty. Retrieved 8 July 2013. ^ Rogio, Bill (25 June 2010). "US designates Caucasus Emirate leader Doku Umarov a global terrorist". Long War Journal. Retrieved 10 July 2013. After Basayev's death in 2006, the Chechen and Caucasus jihadists united under the command of Doku Umarov, one of the last remaining original leaders of the Chechen rebellion and a close associate of al Qaeda. ^ Williams, Carol J. (19 April 2013). "A history of terrorism out of Chechnya". Los Angeles Times. Retrieved 13 July 2013. ^ Feifer, Gregory (9 September 2009). "Ten Years On, Troubling Questions Linger Over Russian Apartment Bombings". Radio Free Europe/Radio Liberty. Retrieved 13 July 2013. ^ Krechetnikov, Artem (24 October 2012). "Moscow theatre siege: Questions remain unanswered". BBC News. Retrieved 13 July 2013. ^ "Chechen rebel claims Moscow attacks". Al Jazeera. 31 March 2010. Retrieved 13 July 2013. ^ "Chechen terrorist claims responsibility for Domodedovo Airport bombing". Russia Today. 8 February 2011. Retrieved 13 July 2013. ^ "Chechen warlord Doku Umarov admits Moscow airport bomb". BBC News. 8 February 2011. Retrieved 13 July 2013. ^ "Chechnya profile". 17 January 2018 – via www.bbc.com. ^ Crawford & Rossiter 2006, p. 99. ^ "Russia: Chechen Official Puts War Death Toll At 160,000". Radio Free Europe/Radio Liberty. August 16, 2005. Retrieved 4 October 2017. Dunlop, John B. (1998). Russia Confronts Chechnya: Roots of a Separatist Conflict. Cambridge: Cambridge University Press. ISBN 9780521636193. Crawford, Marisa; Rossiter, Graham (2006). Reasons for Living: Education and Young People's Search for Meaning, Identity and Spirituality. Aust Council for Ed Research. p. 99. ISBN 9780864316134. James, Patrick; Goetze, David (2001). Evolutionary Theory and Ethnic Conflict. Westport, Connecticut: Praeger. ISBN 9780275971434. Kempton, Daniel R.; Clark, Terry D. (2001). Unity or Separation: Center-Periphery Relations in the Former Soviet Union. Praeger. ISBN 978-0275973063. King, Charles (2008). The Ghost of Freedon: A History of the Caucasus. Oxford: Oxford University Press. ISBN 978-0-19-517775-6. Kumar, Rajan (2006). Ethnicity, Nationalism and Conflict Resolution: A Case Study of Chechnya. Gurgaon: Hope India. ISBN 9788178711195. Schaefer, Robert W. (2010). The Insurgency in Chechnya and the North Caucasus: From Gazavat to Jihad. ABC-CLIO. pp. 49–61. ISBN 9780313386343. Shultz, Richard H. (2006). Insurgents, Terrorists, And Militias: The Warriors of Contemporary Combat. New York: Columbia University Press. ISBN 9780231129824. Smith, Sebastian (2005). 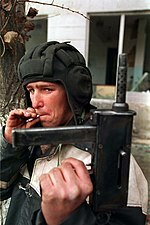 Allah's Mountains: The Battle for Chechnya. Tauris Parke Paperbacks. ISBN 978-1850439790. Ware, Robert Bruce (2005). "A Multitude of Evils: Mythology and Political Failure in Chechnya". In Richard Sakwa (ed.). Chechnya: From Past to Future. London: Anthem Press. pp. 79–115. ISBN 1-84331-165-8. Daniel, Elton L. "Golestān Treaty". Encyclopædia Iranica. Retrieved 10 October 2013. This page was last edited on 8 April 2019, at 12:13 (UTC).